There are three men banging away at my roof right now. They’ve been at it for two days, and it doesn’t really look like they’re going to be done today either. This is obviously going to cost more than they quoted me. It could be a lot more. One of them, the leader, has a really scary mouth. His gums and lips are red and puffed up, so swollen they merge into each other. He says there’s a lot more wrong with my roof than what they’re fixing. He makes a red smile when he says that, even though it looks painful. It’s very noisy – lots of banging, sawing, and strange noises I can’t identify. At one point I heard a crash, and it was a glass light fixture in the dining room falling on the floor. I don’t know why it didn’t break. I’m just glad I wasn’t sitting at the table when it happened. At least they didn’t laugh at me about the roof repair that guy did last summer. I deserve to be laughed at for hiring that loser. That was so stupid I should lose my job, get kicked out of both Codex and Wyrm, and have my children taken away from me. If they weren’t both adults, anyway. But someone should come and take away my cats. Maybe impound my bicycle. I kept working on store stuff for an extra hour I won’t get paid for, because I can’t concentrate on anything I really want to do with people up there. I know it’s stupid, but I just want them to go away. I don’t like strangers on my roof. My cat is stalking me. I was lying in bed and heard a THUNK against the door. This is a door you can open by pushing on it, without using the doorknob. Lately Mike has taken to bumping it open so he can get into my closet and sleep in a basket in there, usually knocking a bunch of stuff down in the process. I don’t encourage him to do this, but a lot of times I’m reading or writing and too preoccupied to deal with him. Anyway, I was trying to sleep when Mike thunked his way in. I got up, tossed him out the door, closed it, and fastened the little deadbolt latch at the top. I could hear him thunking against it some more, even running down the hallway to thunk it harder, but I went back to sleep anyway. When I woke up, he was back in the room again, having somehow made a hole in the door. When I unlatched and opened it, I saw he’d somehow brought a chair into the hallway outside. He must have climbed up onto the chair and clawed his way in. I covered up the hole with newspaper, sheet plastic and duck tape. I tried to get back to sleep, but of course it was no good. As I lay in bed, I could hear Mike rip through the paper and plop back down onto the floor of my room. I’ve been dreaming more than I used to–once every couple weeks or so. Usually I only remember snatches and impressions, but this time it was freakishly realistic. When I woke up for real, I was surprised to find my door wasn’t even latched. I couldn’t stop looking for the hole, the chair, the cat-shredded newspaper. This year’s race is why I love this thing. 1. Jeff King, a 58-year-old guy with four Iditarod victories going back to 1981. A native of Northern California, he grew up close to Jack London’s house, now a historical museum. I used to visit there when I was a kid, too. He read everything by London, got himself up to Alaska as soon as he could manage it, and never looked back. He’s a very friendly guy, cracking jokes while he welcomes visitors to his kennel for tours. If he wins, he’ll be the oldest winner in Iditarod history. 2. Aliy Zirkle, a woman in her mid-forties, who finished second in both 2012 and 2013. She and her husband, Allen Moore, run a kennel and share the dogs (Or “dawgs,” as they’re universally called in mushing. It’s not a regional thing; mushers say “dawgs” whether they’re from Arkansas, California or Canada. ): he runs the A team in the Yukon Quest, the other big annual mushing event of the year (which he’s won the past two years), and she gets them for the Iditarod. Aliy may be the most beloved musher of all time — she’s got a beautiful personality, is insanely in love with her dogs, and knows how to rock Facebook. If she wins, she’ll be the first female winner since Susan Butcher won in 1990. 3. Dallas Seavey, a 27-year old guy born into a mushing family, who won in 2012, making him the youngest winner ever. In 2013 he came in fourth running rookie puppies (not sure whether they were his dad’s or his own), which is just unheard of; top ten positions usually go to teams of veteran dogs, while the young dogs take it easy and get the hang of the trail. Dallas has his own kennel now, and it’s a strong one. Dallas, a former Olympic wrestler, is pretty strong himself. He’s known for mushing in running shoes, the better to run alongside his sled, to make things easier for the dogs. 4. Mitch Seavey, 54, Dallas’ dad. Mitch won in 2013, his second victory and eleventh top-ten finish. His dad was a musher, and all four of his sons are mushers. The Iditarod is pretty much what he does, and he does it awfully well. So, they came into White Mountain in those positions, with something like an hour or two between them. There’s a required eight-hour stop at White Mountain. Usually, whoever gets there first wins the race. So Jeff took off an hour before Aliy as the presumed winner. Boy, that would have been boring. The route from White Mountain to Nome goes along the coast, part of it along a spit of land with water on both sides. It rained recently, so everything is covered with lumpy ice. The whole trail has been like that, and mushers have been dealing with slipping sleds, injured dogs, and crashes all week. Along the coast, the ice is interspersed with driftwood. Snow machines (as snowmobiles are called in Alaska) clear the trail and put down markers one time before the race; there’s no further maintenance to the trail. As it happens, this time, the lead mushers are running the final stretch at night. The winds along that coast can be fierce, but this year they’re worse than usual, blowing at 45 miles per hour and gusting up to around 70. This is on ice, remember, with water on both sides. There’s just enough snow to blow all over the place and ruin what little visibility there was to begin with. The actual temperature is somewhere around zero, never mind the wind chill. Jeff has a malfunction, and has to stop to fix it a few miles before getting to the halfway-to-Nome checkpoint called Safety. His dogs hunker down while he’s doing this, and by the time he’s ready to go they’re too cold to move. He puts his sleeping bag over them, lies there holding them, waiting for the wind to die down a little. But the wind remains lethal. He figures he’ll walk to Safety alone, maybe carry the dogs in one by one, but it’s just too cold; the dogs are in danger of freezing to death. He ends up accepting a ride from a snow machine to Safety so he can get help for the dogs faster, which disqualifies him from the race. The snow machines are blowing over too, and one rider gets blown off towards the water, but everyone survives. When he gets back to his dogs he’s just relieved to find them all still alive. Meanwhile, Aliy has passed Jeff and his team without seeing them. She’s too busy getting beat up by the wind herself. It keeps whipping the sled sideways on the ice, which pulls the dogs off-course, and puts everyone in danger of getting blown into open water. Somehow she makes it into Safety and finds out she’s in the lead, but at that point she’s more concerned about keeping herself and her dogs from dying than with winning the race. She gets her dogs as comfortable as possible, then goes inside the roadhouse to drink coffee and wait out the wind. She waits at Safety long enough that Dallas catches up. He doesn’t stop. He doesn’t even wait around long enough to find out he’s in the lead. Why? Because his dad’s behind him, and the last thing he wants is to lose to his dad. So he lets the vets have their required look at his dogs, then takes off out of there like he’s being chased by demons. Aliy figures if Dallas made it through, the weather must have improved. It’s still brutal out there, but the winds have died down some from hurricane force. She takes off in pursuit of Dallas. Dallas is running this thing like a maniac. He sees a light right behind him now and figures it’s his dad’s headlamp. Somehow his dad has caught up to him, he thinks, which means the old man must be running his dogs at an incredible pace. He’s going to get caught up at any minute, and he can’t let that happen. At the finish line, Dallas comes into Nome running alongside his sled, looking over his shoulder as he sprints down the street and under the burled arch. As he catches his breath and goes to take care of his dogs, he’s still asking if he beat his dad. As far as he knows, Jeff and Aliy came in hours ago, and are sitting around somewhere enjoying hot soup while their handlers treat their dogs to steak dinners. It takes more than a minute for the finish line crew to convince him he’s won the race — in record time, at that. A couple minutes later, Aliy comes in second. She made up some time on Dallas, lord only knows how, but not enough. An hour or two later, Mitch comes in third. That. Is what I call a race. You can tell spring is coming — the quality of the snow is different. It’s icier now, less flaky. Actually, it got above freezing yesterday and the day before. Monday I think it got up to 50, warm enough to have the door open at work. It’s nice to have the fresh air, and the open door helps draw in customers. Sometimes I’m not sure it’s worth it. The customers it brings in tend to be people just wandering around enjoying the warm weather; they don’t even necessarily have any money on them. One guy came in who appeared to be a homeless guy. He had all the teeth on the upper left quarter, all the teeth on the lower right, but not much else, dentally speaking. Alcohol on his breath, and he sort of reeked. It was early evening, and I was in the store alone. “Take a look at this.” He pulled a gun out of his jacket and set it on the counter. I’d never heard of a CO2 gun before, except for paintball markers, and the ones of those I’ve seen are larger, rifle-shaped and often colorful — and plainly are not real. I looked it up later and found out there is such a thing as a pistol-shaped CO2, but I’m still not sure what you’d want one for. Especially downtown, which I’m assuming is where a homeless guy would find it. It looked like the kind of thing you’d carry if you wanted people to think you had a gun, but didn’t want to get in trouble for carrying a real one. Yeah, good luck on that one. He kept talking for another five minutes, while I kept trying to politely but firmly get him out the door. Drunks don’t respond well to tact, but I didn’t want the guy mad at me. Finally he left, and no harm done, but I wonder if I should have called the police or something. The whole thing was a little weird. This is what I love about the upper midwest: If you try walking on water in California, they laugh at you; here, they just figure you’ve got your dog out there somewhere. Because if you’ve got a dog, there’s nothing better than a frozen lake. I don’t actually have a dog anymore (sniff), but I still like going out on the lake a couple times a year. It was cold enough today that I even put my hood up. I’ve had this winter jacket for three or four years now, and I don’t think I’ve ever put up the hood. I hate things around my face–it’s got to be pretty damn cold before I’ll wear a hat or a scarf, and don’t even start with me about jewelry. But you get out there on that lake ice and there’s nothing to stop the wind. I think about California all the time, about how much I miss the ocean. But if I ever went back, I think I’d miss winter more. Yesterday when I was walking to the store, I noticed a piece of thread embedded in the snow on the bike path. It was used-to-be pink, and just kept going and going–it even crossed one street. After a while I picked it up and ran it through the groove in my glove between the thumb and forefinger, to make it easier to follow. I kept thinking it would end in a spool, but I never saw one. Eventually I found the end in the snow piled by the side of the path. It went on for a quarter of a mile. Danny and I went sledding. Not the best hill, but not bad either, and right by the lake too. 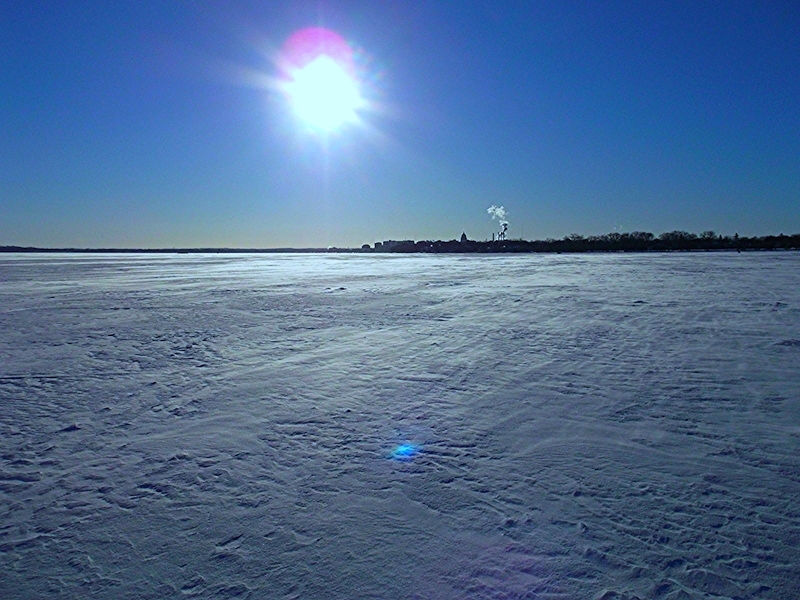 The lake is white and hard all the way through–I walked out, but only a hundred yards or so. Lots of kids on the hill, some with nice sleds and fancy toboggans, some with the crappy plastic ones like we’ve got that go a whole lot faster. It’s snowed the past five days (I think? ), but the main part of it is packed, which makes it really fast. It’s like the thing about poetry being “physically as if the top of my head were taken off,” only the opposite way, where your brains sort of smack painfully into the top of your skull and don’t have anywhere else to go.